Both candidates for Mayor in this month’s local government election are serving on a committee charged with finding ways of preventing catastrophic and potentially life-taking flooding of Alice Springs. The committee has made virtually no useful progress in a year and a half. The Flood Mitigation Advisory Committee was set up in February last year and includes incumbent Mayor Damien Ryan (front row at right in this photo from the report) and the challenger for the top council job, environmental activist Jimmy Cocking (standing, second from right. The others, standing, from left are Ken Lechleitner, Rod Cramer and Michael Sitzler, and seated is Russel Lynch). In June last year the committee published a draft report that made six recommendations about preliminary investigations and structural mitigation. One year later, on June 21, Member for Braiting Dale Wakefield released the committee’s final report with almost exactly the same recommendations except for minor additions, and the deletion of the sixth (a geomorphologic study). No further flood planning can be done until these topographic data are available, says Mr Cocking, but he understands the NT Government is now calling tenders for the work. Chairman, Mr Ryan could not be contacted but we have left messages requesting comment and will publish it once received. When the tenders have been let, the best part of two years will have passed since the formation of the committee and before any meaningful work to protect the town can even begin. Another big rainfall event occurred in December 2016. According to the Bureau of Meteorology, on the 25th, Wulungurru (Kintore) had a 24-hour fall of 231.6 mm which was a 1 in 100 year event. A similar event would be possible in the Alice Springs region. It is broadly accepted that climate change will seriously heighten the risk of flooding as ferocious downpours like these become more frequent. Mr Cocking agrees with that assertion. The committee may be re-inventing the wheel: The Alice Springs Flood Mitigation Dam environmental impact statement of October 1990 comprehensively deals with the issues. The dam was knocked on the head by Canberra (google this site for comprehensive coverage) but the moratorium imposed has now expired. Mr Cocking is not sure how many people have died in the floods but “from what I understand it’s close to nine in total since records began,” he says. Is that number mentioned in the report? “From memory, no,” says Mr Cocking. Doing a “find” of the report for death, drowning and died seems to prove him right. There would be “catastrophic risk if we have a one in a thousand [year] flood that we are unprepared for,” says Mr Cocking. “There is the possibility, if there was a cloudburst with hundreds of millimetres of rain dumped within the catchment, that we could face a catastrophic flood that would sweep through town quite quickly. He says emergency services would send text messages “but for people who don’t have mobile phones there is limited capacity to let them know about a rapid onset flood”. The recommendation for “an assessment of all existing trunk (major) drainage infrastructure” requires a conversation between the council and the Territory Government, he says, except “there has been some passing of the buck. “Until the topographical study has been done we can’t consider options” and “the mitigation works cannot continue until the topographical work is done”. We put to Mr Cocking that nothing has been done in the last 12 months on an issue where lives are at risk. “Have you said anything about this in a meeting of the committee?” we asked. Mr Cocking answered this by saying there had been a meeting in May this year with Treasurer Nicole Manison when she announced funding for the topographical survey. This was nine months after the election of the Labor Government. Making this point “you would normally leave to the chair of the committee,” Mr Cocking says. Was there something stopping him from raising the issue vigorously much earlier? “I raised it when I had the opportunity.” He didn’t say when and with whom. Let’s not rush off for “action on this report” and re-engineer a river system that no one fully understands. 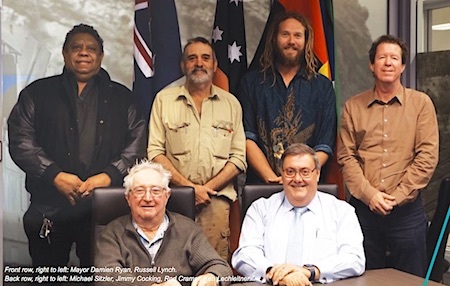 Before the Flood Mitigation Advisory Committee Draft Report was published, neither mayoral candidate Jimmy nor Damien hosted a meeting with the groups they represent (ALEC members or Alice Springs residents) to obtain our informed consent about a decision that will affect everyone. Thus any further planning needs a more democratic and inclusive decision-making process. I wrote on 7 January 2017 an Alice Springs News essay warning of the consequences for regulating the Todd River. Several long-time residents commented with practical strategies that were not considered in the Final Report. The comments on this week’s article show that other residents also have much to contribute. I suggest that any decision to change a river system that is older than humanity needs our full consideration of any long-term impacts – including the option that we people are the ones who need to change. The most effective recommendation can be our willingness to adapt to our environment. @ Tru But: I think you will find the causeway is a minor impediment and the major issue is the narrow Gap itself. If you wanted to reduce the risk you might widen the Gap by a 100 metres or so. I am sure that would be a popular move. It would seem that the town was built in the wrong place so whatever you do will be expensive and possibly have limited effect. Following the surveys it may be possible to identify a site for a retention basin which holds water back temporarily rather than building a dam. It would be equivalent to building another Gap above the town. Maybe every home should have a life boat. Erwin, the FMAC is made up of volunteers who nominated and were appointed to advise the NT government. The report is the advice. It is now up to the NTG to act on the report. For too long I have been keeping a guilty secret about the Todd and flood mitigation. In the Great Banker of ’73, Three Young Reckless Melanka Louts foolishly decided to chance their arm and swim downstream,from Anzac Oval under the causeway footbridge and into the Blue Grey Wild Water Yonder, to The Gap. That was the theory, anyway. Oh foolish dreams of youth! Extreme cold, a swirling rip tide and dangerous river bed debris quickly brought them undone, almost tragically. Two of the three managed to make it to the river bank, just below the Old Riverside. The third, however, nearly cashed in his chips. In one last desperate lunge after going under numerous times he rolled unceremoniously on the gravelly bottom, managed to wrap flailing arms around a big tree stump which appeared as if by miracle, in deep midstream. Three hours of freezing cold, howling wind, rain and hanging for grim death like a wet and gravel-rashed shag on a rock he was rescued by the valiant Emergency Service, to the raucous cheers of the back bar patrons of Riverside who gathered for the entertainment. Next edition of The Centralian Advocate, front page along the lines of “Young Idiots waste valuable time and energy of Emergency Services Heroes”. The three young idiots spewed up gravel, got examined and survived to live, love and generally commit further mayhem in later life. And the moral of this fact of history? The Flood Gods of Todd did not exact vengeance on these ratbag vagabonds. For a divine reason. The sparing of their lives was sent as a friendly warning to us mortals to get our flood mitigation act together. Fourty-four years later, we appear to have forgotten the message of the Flood Gods. We aren’t supposed to get any action out of the Flood Mitigation Advisory Committee, Erwin. They are in place to mitigate the advisory committee and Alice Springs Town Council against public litigation in the event of a flood that damages the town. I’m not a hydrologist but it seems pretty obvious when you drive over the Heavitree causeway that the river is several feet lower on the south side. The causeway is in effect a dam that is causing a buildup of soil on the north side and making the river shallower. If the causeway was lowered would not the sand move through and deepen the river in The Gap and allow more water through quicker, thus lowering the risk of flooding?